At the bottom of the camera is a tripod fixing hole that's suitable for tripod screws less than 5.5mm, and a compartment for the lithium ion battery and Memory Stick Duo (Pro or standard) memory card. 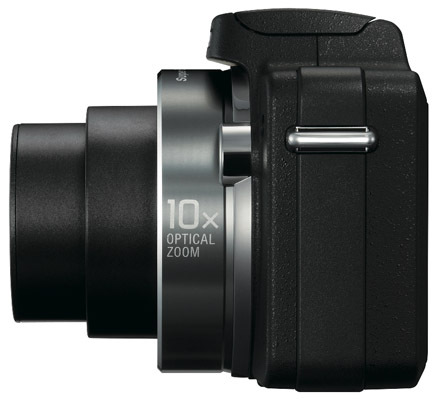 In addition to a 6.3-63mm optical zoom - equivalent to 38-380mm on a 35mm camera - there’s a Carl-Zeiss Vario-Tessar lens; 1/2.5in CCD with 8.1 million effective pixels; 31MB internal memory; face-detection technology; an anti-shake system; and red-eye reduction. Shutter speed ranges from 1/4-1/2000s in auto mode and 30-1/2000s in manual mode. The ISO settings range from 100 to 3200. Although there are various autofocus modes on offer, there is no manual focus setting. There are a handful of flash modes, including auto, forced and synchro; a selection of white balance settings, such as fluorescent and incandescent; exposure control - ±2.0EV in 0.3EV steps - and 12 scene settings including twilight, landscape, beach and snow. 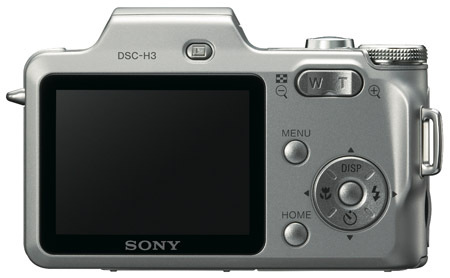 Accessories-wise, Sony provides a multi-connector cable, CD-Rom containing full instruction manual and photo management software, and a large lens hood. The latter is a useful add-on, although its large size obscures some of the flash. Switch-on is fast and shutter lag performance most impressive – even with the flash switched on, the response was blisteringly quick. When it comes to general operations, we’re not quite sure why Sony likes its two-menu system so much – we think it’s a bit fussy. However, the DSC-H3’s menus are clear and simple to use, helped by colour highlights which show you exactly where you are, and short text descriptions for each setting. Image sizes can be set from 3264 x 2448 pixels to 640 x 480. You can also shoot in 3:2 mode or 16:9 mode for displaying on an HDTV set - the connecting cable is an optional extra. There are three movie modes, with two offering 640 x 480 (VGA) resolution at 30fps and 17fps, and one that's 320 x 240 at 8fps.